Partners, "PLUG IN" to STEM activities happening in your area. The purpose of this event will be to introduce volunteers to this year's MATE ROV Competition roles, missions, and props, and to give you a chance to build and play with a simple ROV. Please come to this event, and encourage your fellow volunteers (or prospective volunteers) to join you. To sign up as a volunteer, fill out this survey. Are you excited and ready to get started? Fortunately, there’s no need to wait until April 9th to learn about the competition! You are always encouraged to READ THE MANUALS which can be found on the MATE ROV Competition website, along with FLY THROUGH VIDEOS, descriptions of all the PROPS, and much, much more! In addition, information specific to our Oregon competition can be found on our Regional website: https://oregon.materovcompetition.org/. Our Oregon Regional will feature SCOUT, NAVIGATOR, and RANGER teams only. RANGERS will have the opportunity to attempt all three mission tasks described in the manual. In contrast, SCOUTS and NAVIGATORS will only be offered mission task one and two (but not three). Can't attend the information session? See the list of events below! In 2019, Science Mentors will be matched with K-6 classrooms, visiting students at Toledo Elementary regularly to help them work on their science inquiry projects. A culminating public family event will be held April 24, 2019. All mentors must be cleared as a volunteer for the school district. To volunteer as a mentor, fill out this survey. Questions? Contact cait.goodwin@oregonstate.edu. Students of teachers who have attended MWEE workshops will share displays of the Meaningful Watershed Educational Experiences they have been working on this spring. SWS events will be held in Newport on March 19, Charleston on April 30, and Astoria on May 14. STEM professionals are needed to help review student displays, lead field activities, and give presentations. To learn more, contact cait.goodwin@oregonstate.edu. The Oregon Game Project Challenge (OGPC) is the only state-wide game programming competition in Oregon. OGPC introduces middle and high school students to computer programming basics while educating them in science and current events. They are seeking volunteers for their annual April competition in Monmouth, OR. Volunteers help with the state tournament in April that takes place in Corvallis. Middle and high school student teams are tested on their knowledge. Team registration typically begins in January. 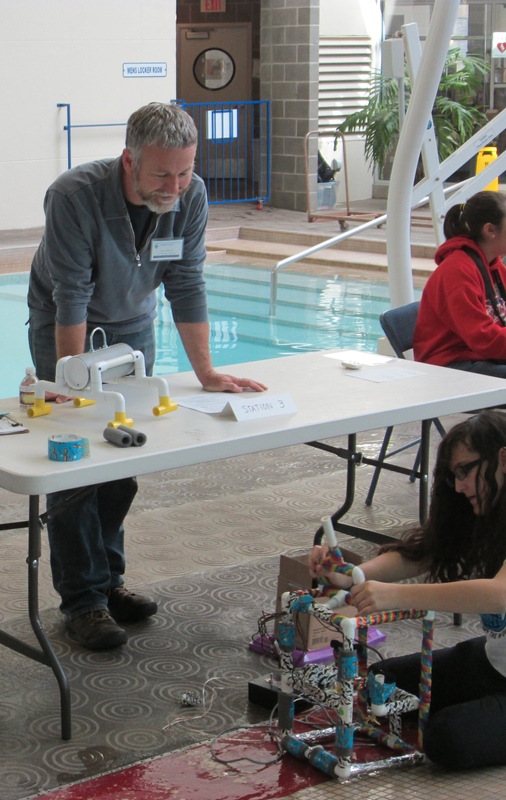 Oregon's regional competition for the National Ocean Science Bowl was held this year on February 2, 2019, and volunteers are invited to help participate with the quiz-bowl style competition held at Oregon State University. Serve as a judge or help with logistics; a training session was held January 8 in Corvallis. For more information, contact salmonbowl.volunteer@gmail.com. Students in grades 4-12 bring their wave energy devices, wind turbines, and/or solar devices to the Hatfield Marine Science Center in Newport to test in wave tanks, wind tunnel or under high powered lights to see which designs produce the greatest amount of energy. Volunteers support teachers in professional development workshops, mentor student teams, and/or serve as a judge or event volunteer on competition day. Watch a short video about the 2017 competition. To get involved with the March 5, 2019 challenge, fill out the volunteer survey or contact Tracy Crews at tracy.crews@oregonstate.edu. Community Mentoring Program - In Tillamook School District, community mentors are resources for students working on science fair projects, project-based learning units, and more. For more information, contact Clair Thomas at thomasc@tillamook.k12.or.us. 21st Century After School Program - The 21st Century Community Learning Centers After School Program in the Lincoln County School District provides 2.5 hours of afterschool enrichment for students each school day, with a focus on science, technology, engineering, mathematics, arts and reading. Volunteers are needed to help provide STEM enrichment activities. Visit the website for more information. FIRST LEGO League - The Oregon Robotic Tournament and Outreach Program provides information about robotics programs and competitions held throughout the state. Visit the ORTOP website to find out more about being a team coach, a mentor, a judge, a referee and more. MATHCOUNTS - This national middle school coaching and competitive mathematics program promotes mathematics achievement through a series of fun and engaging "bee" style contests. Help a middle school teacher in your area start a team! For more information, visit the MATHCOUNTS website for more information.